Amber Interior Design: Wuz Crack-A-Lackin?? ummm hello? Looking fan-freakin-tastic! CANNOT wait to see the finished product. Well done! The book shelf came out fantastic. Great job. We rally like the color tones you used. I love these pillows! Could I possibly order some through you? Please let me know! Also, just curious I live in North Carolina obviously probably too far for you to travel to work here but do you do anything through online? Such as sending pictures, products without me having to pay to fly you here to see my room? Is that slipcovered chair a rocker? I'm on the prowl for a rocker that looks that awesome. Oh Boy - I LOVE that Zimba fabric on the window seat!! You are GOOOOOOD. 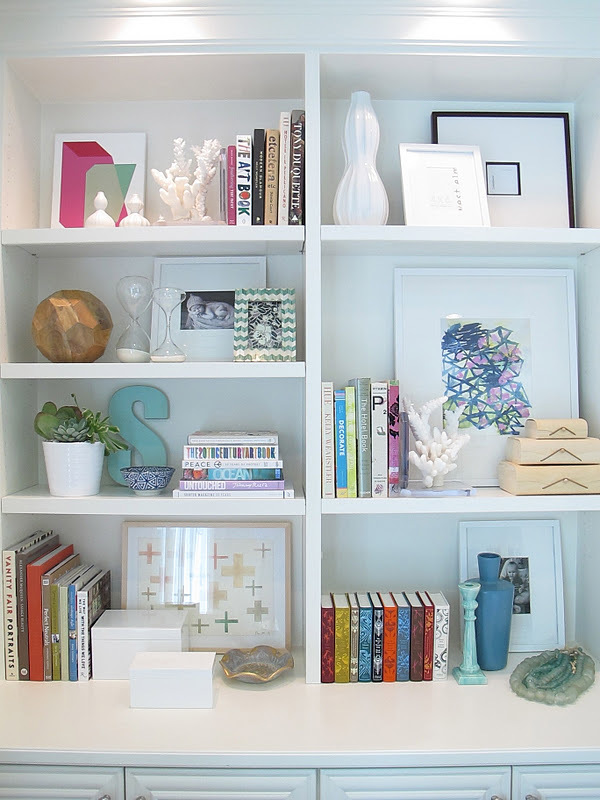 BTW - awesome bookcase styling. Can you come over to my house ?? wow, that's absolutely gorgeous, and i'm definitely showing these pictures to my husband to further convince him we need built-in bookshelves! OMG, I'm obsessed. Perfection! LOVE it all. 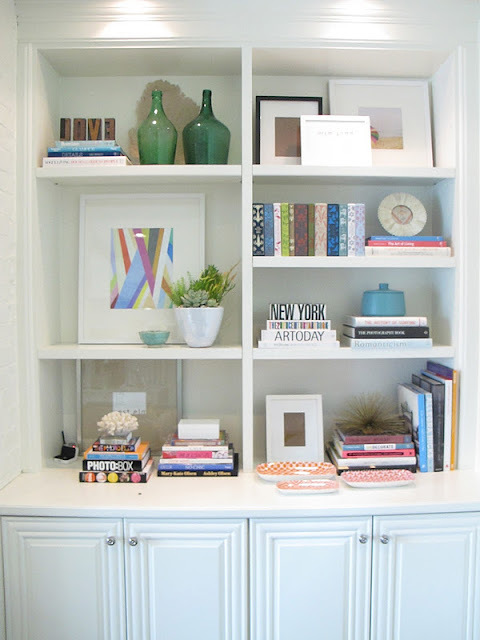 Gorgeous styling on those shelves - had to pin them both for future inspiration! love the art and pretty books. home run. It looks AMAZING!! Can't wait to see more!! For being so busy you sure are putting some awesome spaces together!! LOVING THE ARTWORK in the book cases. Excellent job with scale! Hi Center Stage.. Please email me and I can give you details about my E-Design services. You can also get more info from my website. WOW - everything is looking absolutely gorgeous!!! You've got some serious talent, Amber! you are damn good. love everything about it. Also, what was used as the nook seating? Cabinets? You're a genius at putting random fabrics together and making it look amazing! This is great! 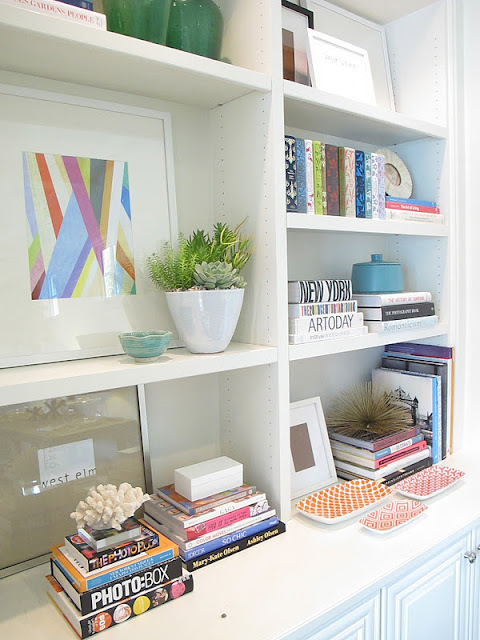 I am loving the blues and oranges on the shelf, and those pillow fabrics are amazing! I'm loving the built-in seating with the Schumacher on the cusions - love love!! I don't know if you were able to get an answer or not, but Center Stage may not have her profile set-up so that you could reply back to her in e-mail. But that's my troubleshooting guess. Have a good one Amber - I really admire your design style. I'll be studying those pretty shelves for a while - they're great. They look fantastic - love all the details! Love it! Where did you find all the colorful hardback books?! The photos are great – love what you’ve done on the bookshelf and the throw cushions are beautiful. They go really well with the upholstery. I have a ton of beautiful fabrics that I collected over the years while living in different countries. They do follow a similar color scheme, but I thought they would look too “busy” thrown together. Your post just proved me wrong. Can’t wait to see more of your pics! I really love your idea. Article and pictures is so cool.